Meet Shirley Rivera and Radhika Rao. Shirley and Radhika met during the 2015 Femprovisor Festival. 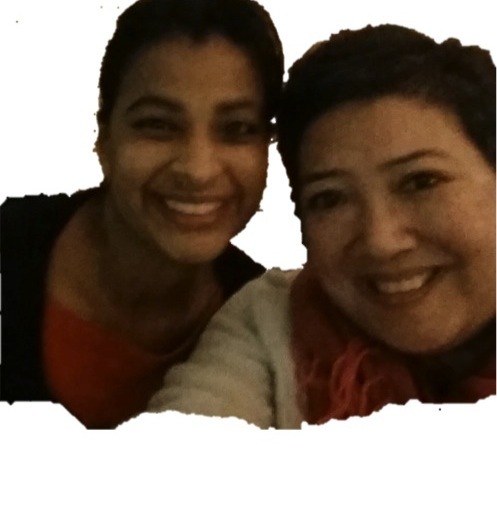 Radhika Rao and Shirley Rivera met during the 2015 San Francisco Femprovisor Festival. They shared similar observations about, experiences with, and opinions of gender equity and diversity in the performing arts. One of their conversations dove into the U.S. Census Bureau’s projection of the national population expected to become majority-minority in year 2042. From this, they discovered a mutual vision they started calling Colorized Improv, with a mission to use the art of improv to bring cultural narratives and diverse perspectives to the foreground for purposeful fun – choosing points of views, creating characters, and discovering scenes related to the evolving cultural landscape. Colorized Letters formed as an improv duo as part of beginning Colorized Improv. The duo debuted at Eth-Noh-Tec’s 2016 Oshogatsu Festival in San Francisco. Afterwards, they performed at jams and were featured in local indie teams’ productions. The duo’s last performance was at San Francisco’s 2016 Femprovisor Festival. Since then, Colorized Improv continues to evolve – influencing improvisors to infuse their play by exploring and expressing the Colorized Improv movement. Colorized Improv serves as an option for a daily dispatch to park and share ideas sparking . COLORIZED IMPROV, inspired by social, cultural, and personal experiences – to explore, express, and cultivate equity among diversity. Inspired by Jeff Chang’s Who We Be: The Colorization of America – COLORIZED IMPROV is improv (performed in any format), inspired by an improviser’s social, cultural, and personal experiences – where an improviser is encouraged to explore, express, and cultivate equity among diversity. COLORIZED IMPROV is where improvisers purposefully choose points of view, become characters, and create scenes related to the world’s evolving cultural landscape. show your work with Colorized Improv. Share your email address to follow this blog and receive notifications of new posts by email.